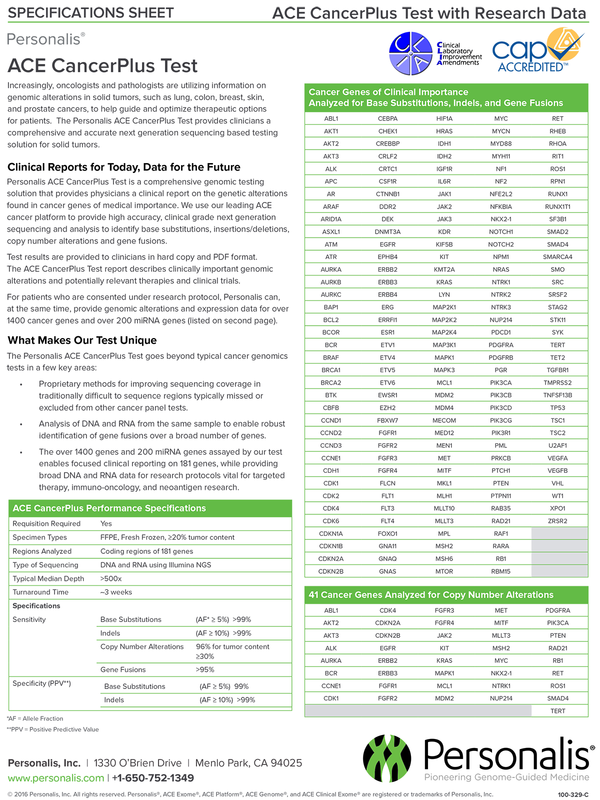 Clinical Reports for Today, Data for the Future Personalis ACE CancerPlus Test is a comprehensive genomic testing solution that provides physicians a clinical report on the genetic alterations found in cancer genes of medical importance. We use our leading ACE cancer platform to provide high accuracy, clinical grade next generation sequencing and analysis to identify base substitutions, insertions/deletions, copy number alterations and gene fusions. Test results are provided to clinicians in hard copy and PDF format. The ACE CancerPlus Test report describes clinically important genomic alterations and potentially relevant therapies and clinical trials. For patients who are consented under research protocol, Personalis can, at the same time, provide genomic alterations and expression data for over 1400 cancer genes and over 200 miRNA genes.